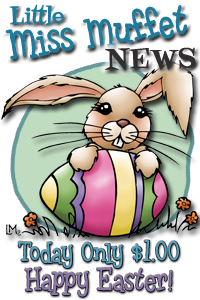 So with out further fuss... here's the Easter Bunny Hiding at a fantastic low price for just $1.00 for today only! Get him while you he's hot then come play along in the Easter Challenge - we'd love to see how you've colored this adorable bunny and egg. And just one more thing before you go... I've updated the sidebar NEWS badge and here is the new code. It will automatically update just like the last one but instead of going to a secluded page you'll now be directed here to the main page where all the latest information, inspiration and challenges are. Thanks for coming by today and have fun with this cute little bunny! Have a very happy Easter day! Happy Easter to you and yours! I have updated the new code on my sidebar. So excited to see the upcoming new release! Happy Easter! I've updated the code on my blog.